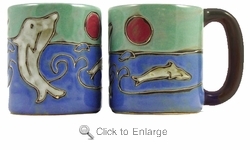 Mara Dolphins Stoneware Coffee Mug is one of her unique designs. It shows a dolphin leaping out of the water and might bring back memories of flipper. Check out other dolphin mugs and marine products here Marine Theme.